A recent wedding invitation with beautiful gold edge painting. 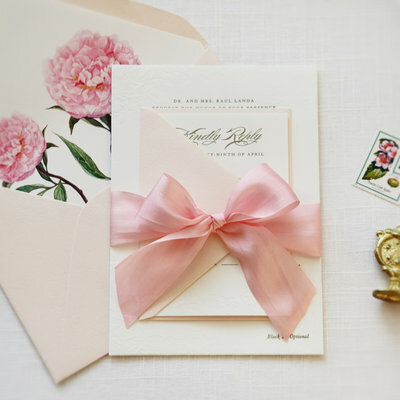 Sweetly Said Press designed the custom monogram wedding invitation and accompanying enclosure cards as well as gold envelope liners. We printed gold ink on double thick 220# Crane Lettra in Pearl White. 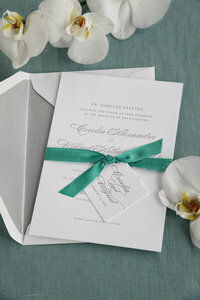 Sweetly Said Press design and printed these classic letterpress invitations for the sweet bride, Cecelia. I love this example of our one-color letterpress. We printed grey ink on #110 Crane Lettra in fluorescent white. 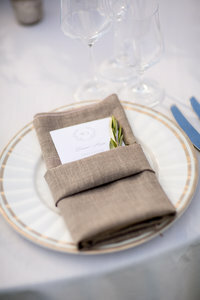 Coral and grey letterpress invitations included in a opal pocket folder for Darcy and Manuel. We sealed the folder with a letterpress tag and coral silk ribbon. The invitation is fitting for their wedding on the Dana Point harbor. This black-tie wedding invitation suite was designed and printed for Irish bride, Orla, and her two-day wedding in Co. Wicklow, Ireland. The floral scroll border was printed with ivory ink with black text on cream 166# Wild stock. Photos to share of recent, custom birth announcements. Photos to share of Jackson’s third birthday and pirate theme fun! Sweet Caroline’s blush pink birth announcements Blue birth announcements for Leo, the lion. A blue giraffe for Henry’s birth announcement. A monogram wreath for lovely Eleanor’s pink birth announcement. Visit the shop.